From the back of a surf shop parking lot emerged the first Tacofino food. From there, Tacofino has grown across the Lower Mainland with restaurants and trucks. 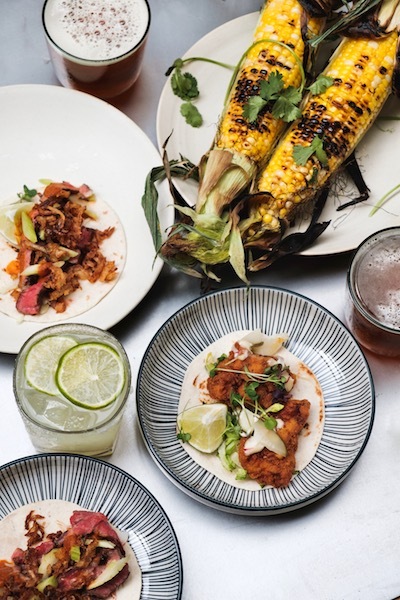 Staying true to our roots, we still use local, sustainable purveyors to create menus inspired by west-coast flavours with a Baja California influence. Ain’t nothing like a taco to take things to the next level; whether you're throwing a party, getting married, or any other event — Tacofino is here to help you take your celebration from a dinner to an event. From rentals to bar service, we have the right people ready to help you plan your event. All of our trucks are fully self-contained and offer a wide variety of menus from cocktail receptions, to full dinner service, to late night snacks, and offer flexible service styles to suit your needs. Inquire within for more information and to start your quote today. Drop us a line with details on who you are and what we can do together, and we’ll be able to whip up a customized menu that fits your needs. Success! The email was sent to us. You can get Tacofino straight to your office with our trusted delivery partner. Foodee is a corporate meal delivery service that provides offices with tasty meals from the finest local restaurants.